Up for sale is this beautifully carved wood Coat of Arms vintage antique probably late 19th early 20th century Mexican Aztec walking stick cane swagger. The Cane is measuring 35 in length. The coat of arms of Mexico (Spanish: Escudo Nacional de México, literally "national shield of Mexico") depicts a Mexican [golden] eagle perched on a prickly pear cactus devouring a rattlesnake. The design is rooted in the legend that the Aztec people would know where to build their city once they saw an eagle eating a snake on top of a lake. The image has been an important symbol of Mexican politics and culture for centuries. To the people of Tenochtitlan, this symbol had strong religious connotations, and to the Europeans, it came to symbolize the triumph of good over evil (with the snake sometimes representative of the serpent in the Garden of Eden). 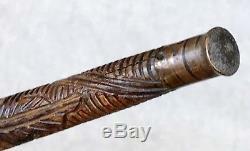 The Cane has old about 1 crack towards the bottom ferrule tip that does not affect the structure. Please see photos as part of the description. We carry large collection of vintage antique walking canes. Please check out our other listings! The item "Vintage Antique 19C Mexican Aztec Coat Of Arms Carved Wood Walking Stick Cane" is in sale since Thursday, October 25, 2018. This item is in the category "Clothing, Shoes & Accessories\Vintage\Vintage Accessories\Canes & Walking Sticks". The seller is "vintagequalityantiques" and is located in Staten Island, New York. This item can be shipped worldwide.